This February, NI India field engineer Paras Loomba traveled to Antarctica as part of the 2041 International Antarctic Expedition. 2041 was founded by explorer and environmentalist Robert Swan, OBE, the first person in history to walk to both the North and South poles. The goal of the expedition was to provide corporate leaders, environmentalists, entrepreneurs, and teachers with first-hand knowledge about climate change in the Antarctic peninsula. Loomba used NI wireless sensor network (WSN) products throughout the trip. For example, he monitored the temperature one night when they camped out, successfully measuring temperature from 2 degrees to -6 degrees Celsius and withstanding wind velocity of 50 knots. Because 2041 encourages the use of renewable energy whenever possible, Loomba used a solar battery to power the monitoring setup. 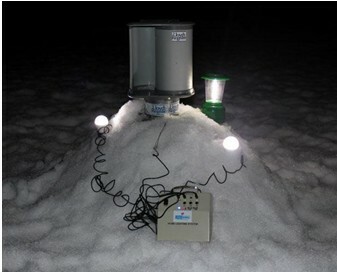 Later in the trip, he collaborated with the participants from Lloyd’s Register Group, using their small wind turbine to power the WSN gateway. >> Learn more about NI’s low-power, reliable wireless sensor network platform at ni.com/wsn. >> See how engineers are using NI technologies to make a positive impact on the global ecosystem at ni.com/green. This is just great! Congratulations to Paras for taking NI to the end of the world! What a way and place to monitor weather and make a positive impact. Great work Paras. !